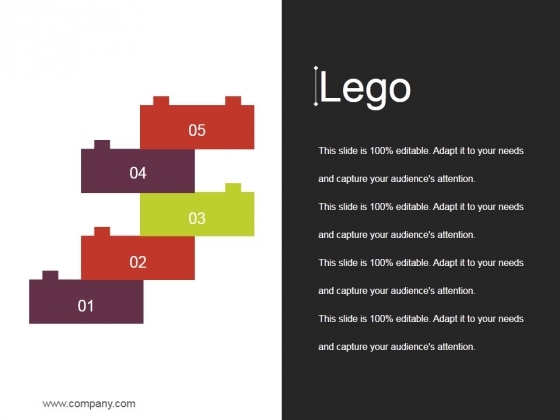 This is a lego business marketing ppt powerpoint presentation themes. This is a five stage process. The stages in this process are business, management, planning, strategy, marketing. Entertain the audience in your adorable way. 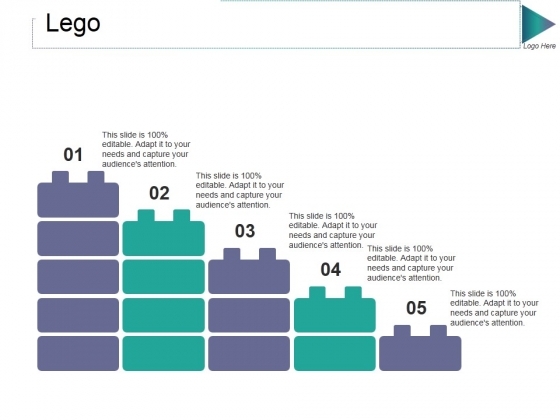 Our Lego Business Marketing Ppt PowerPoint Presentation Themes will make them your fans. 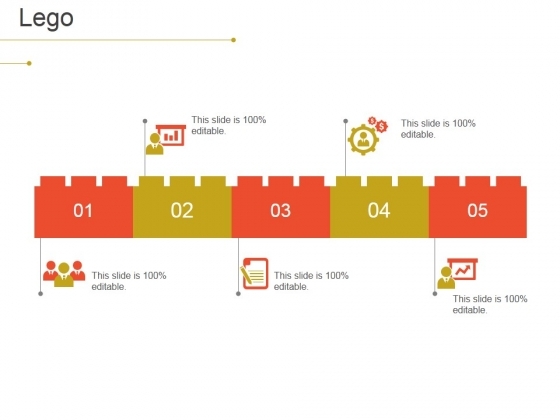 This is a training retention ppt powerpoint presentation portfolio vector cpb. This is a five stage process. The stages in this process are training retention. 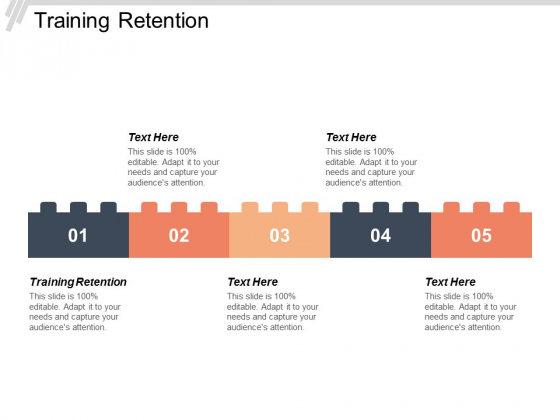 Take your game to the highest level with our Training Retention Ppt Powerpoint Presentation Portfolio Vector Cpb. Dont waste time struggling with PowerPoint. Let us do it for you. This is a lego play games ppt powerpoint presentation file template. This is a five stage process. The stages in this process are lego, play, games, business, management, planning. Nip any falsehood in the bud. Our Lego Play Games Ppt PowerPoint Presentation File Template will nourish the truth. This is a lego play games ppt powerpoint presentation styles example topics. This is a five stage process. The stages in this process are lego, games, play, Planning, Strategy, Marketing. See your audience react before your very eyes. Our Lego Play Games Ppt PowerPoint Presentation Styles Example Topics extract positive delight. This is a lego management ppt powerpoint presentation pictures gallery. This is a five stage process. The stages in this process are business, management, marketing, strategy, analysis. Get better facilities for the community with our Lego Management Ppt PowerPoint Presentation Pictures Gallery. Be able to improve local infrastructure. This is a lego games ppt powerpoint presentation gallery graphics. This is a five stage process. The stages in this process are business plan, management, market strategy, lego. Our Lego Games Ppt PowerPoint Presentation Gallery Graphics get folks interested in giving you a hand. It helps lobby for your cause. This is a lego ppt powerpoint presentation infographics summary. This is a five stage process. The stages in this process are lego, business, management, marketing, strategy. 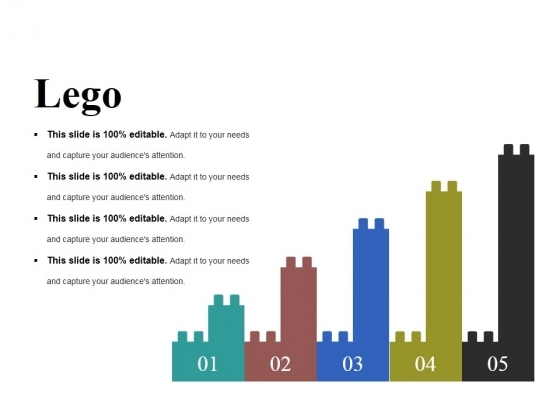 Our Lego Ppt PowerPoint Presentation Infographics Summary add a bit of flourish. It allows you to leave a better impression. This is a lego ppt powerpoint presentation icon format ideas. This is a five stage process. The stages in this process are lego, business, marketing, management, build. Inform folks of key legal clauses with our Lego Ppt PowerPoint Presentation Icon Format Ideas. Advise folks on the litigation. This is a lego ppt powerpoint presentation pictures maker. This is a five stage process. The stages in this process are business, marketing, management, planning, lego. Imagine winning it all with our Lego Ppt PowerPoint Presentation Pictures Maker. Download without worries with our money back guaranteee. 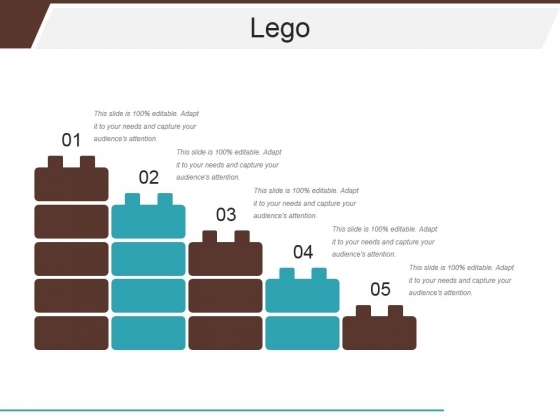 This is a lego ppt powerpoint presentation summary example. This is a five stage process. The stages in this process are sports, lego, business, marketing, planning. 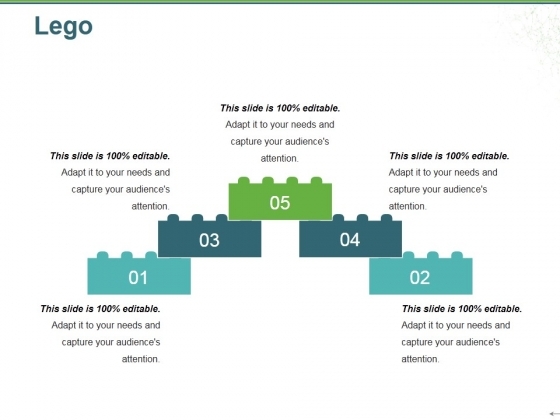 Our Lego Ppt PowerPoint Presentation Summary Example will be an extension of you. You will accept them as your alter ego. This is a lego ppt powerpoint presentation layouts samples. This is a five stage process. The stages in this process are business, marketing, lego, play, children. 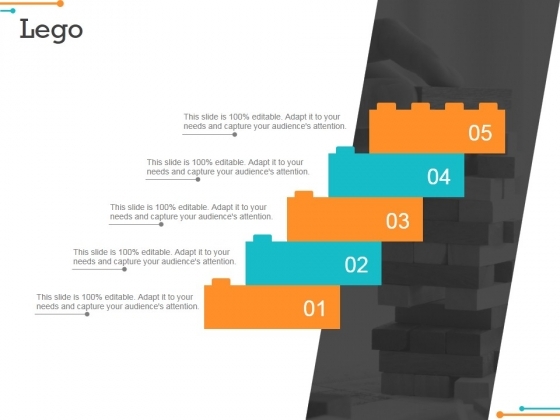 Discover growth with our Lego Ppt PowerPoint Presentation Layouts Samples. Download without worries with our money back guaranteee. This is a lego ppt powerpoint presentation summary images. This is a five stage process. The stages in this process are lego, sports, game, play, success, competition. Force out your enemies with our Lego Ppt PowerPoint Presentation Summary Images. Just download, type and present. This is a lego ppt powerpoint presentation slides graphics example. This is a five stage process. The stages in this process are lego, business, marketing, management, build. 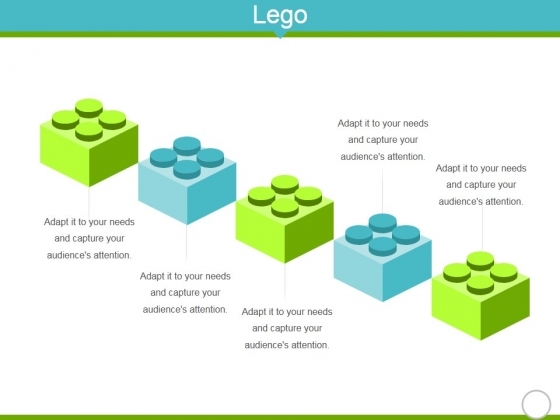 Our Lego Ppt PowerPoint Presentation Slides Graphics Example will be your lucky charm. They will deliver for you on your fateful day. 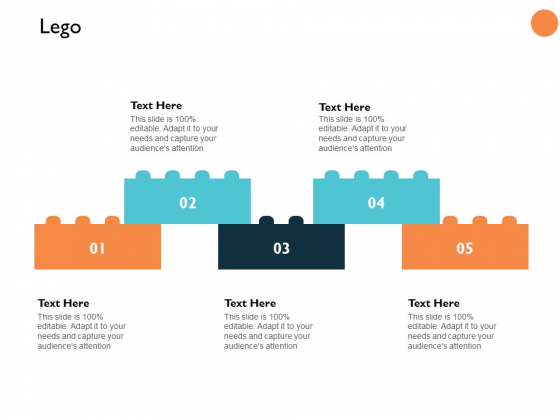 This is a lego ppt powerpoint presentation infographic template microsoft. This is a five stage process. The stages in this process are lego, business, marketing, management, build. 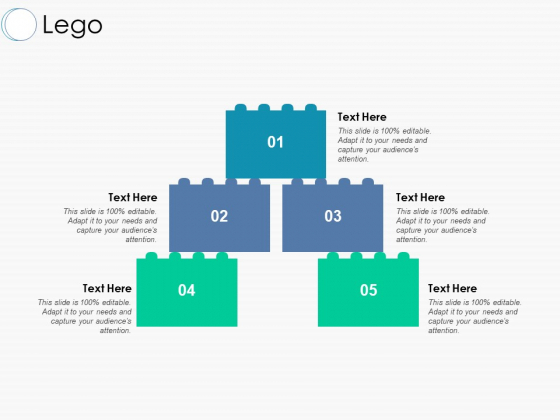 Air your ideas on our Lego Ppt PowerPoint Presentation Infographic Template Microsoft. They will reach the furthest corners. 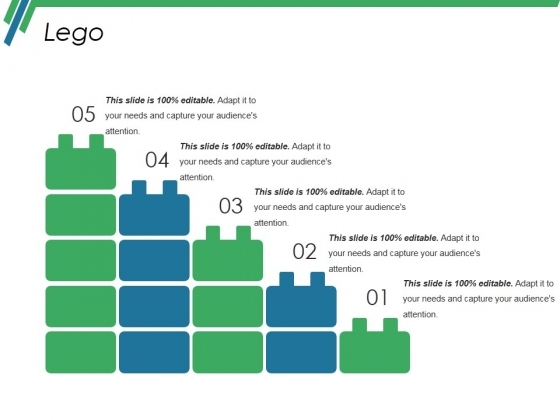 This is a lego ppt powerpoint presentation slides good. This is a five stage process. The stages in this process are game, children, sports, block, marketing. 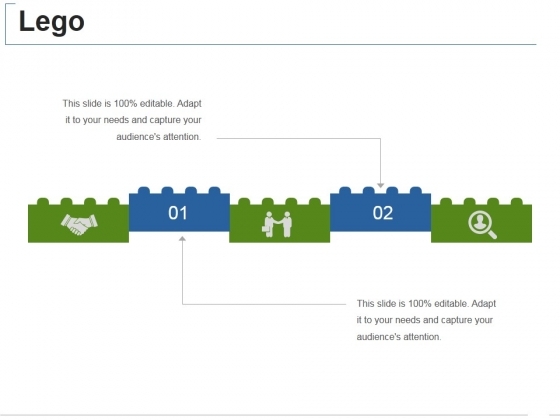 Our Lego Ppt PowerPoint Presentation Slides Good make it a cakewalk. You will dominate the event with authority. This is a lego ppt powerpoint presentation layouts introduction. This is a five stage process. The stages in this process are lego, marketing, strategy, business, management. 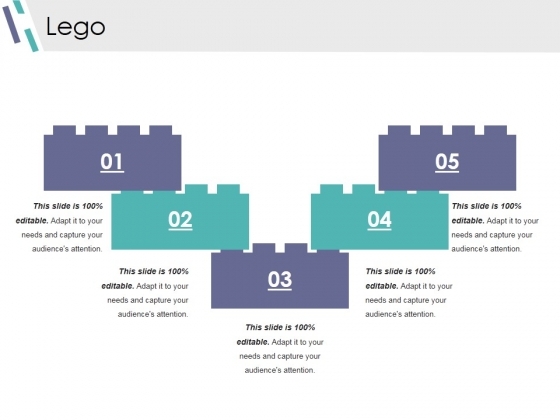 Our Lego Ppt PowerPoint Presentation Layouts Introduction can be aesthetically appealing. Expose your audience to the art of beauty. This is a lego ppt powerpoint presentation infographic template skills. This is a five stage process. The stages in this process are lego, business, marketing, management, build. 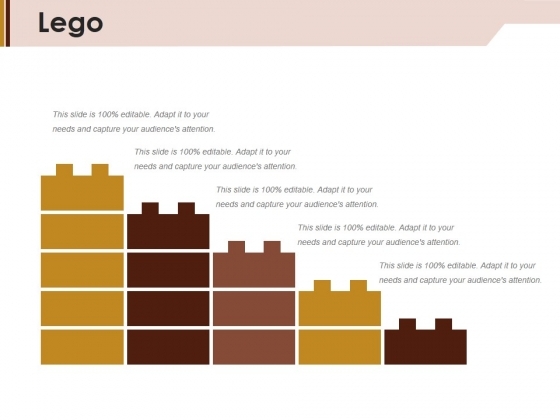 Our Lego Ppt PowerPoint Presentation Infographic Template Skills see it through your eyes. They agree with the basis of your assessment. This is a lego ppt powerpoint presentation file smartart. This is a five stage process. The stages in this process are Business, Planning, Marketing, Sports, Lego. Our Lego Ppt PowerPoint Presentation File Smartart are fairly broadbased. They give you ample scope to address your mind. This is a lego ppt powerpoint presentation ideas example introduction. This is a five stage process. The stages in this process are lego, play, sports, game, child. 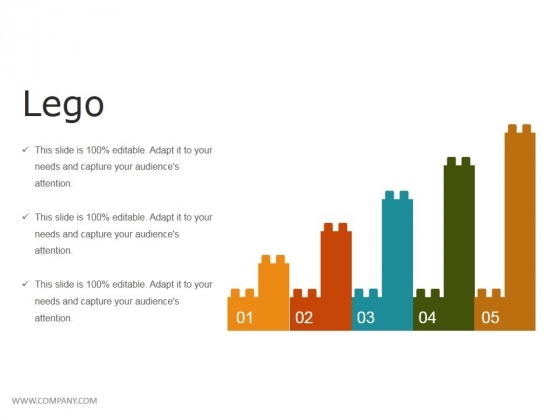 Folks are inclined to be loyal due to our Lego Ppt PowerPoint Presentation Ideas Example Introduction. They benefit from being dedicated. This is a lego ppt powerpoint presentation pictures outfit. This is a five stage process. The stages in this process are lego, strategy, management, business, analysis. Folks express enduring allegiance due to our Lego Ppt PowerPoint Presentation Pictures Outfit. They will be loyal. This is a lego ppt powerpoint presentation professional summary. This is a five stage process. The stages in this process are lego, business, marketing, management. You have envisaged a bright future for your organisation. 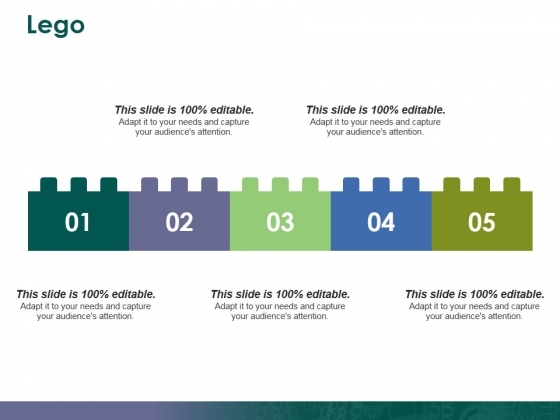 Deliver your forecast on our Lego Ppt PowerPoint Presentation Professional Summary. 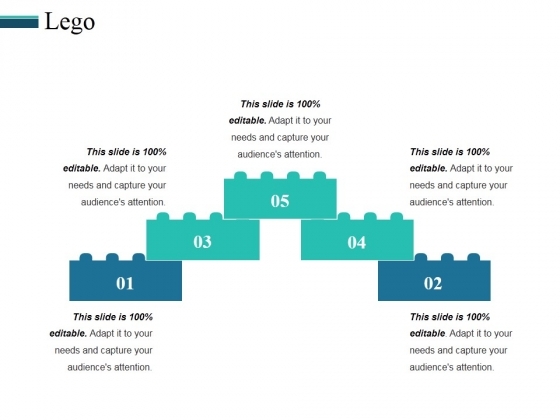 This is a lego ppt powerpoint presentation model tips. This is a five stage process. The stages in this process are lego, management, marketing, business. 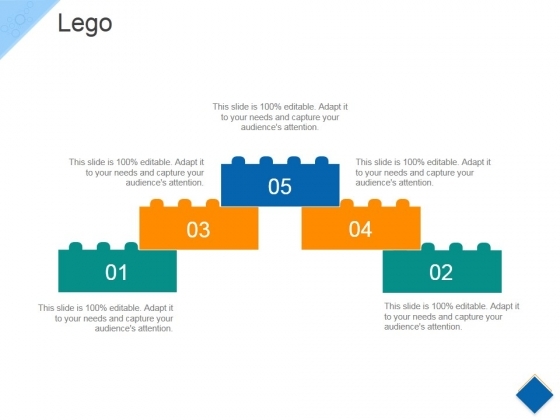 Make outstanding presentations with our Lego Ppt PowerPoint Presentation Model Tips. You'll always stay ahead of the game. This is a lego ppt powerpoint presentation icon deck. This is a five stage process. The stages in this process are lego, block, play, child, game. Encourage the enthusiasm in your team. 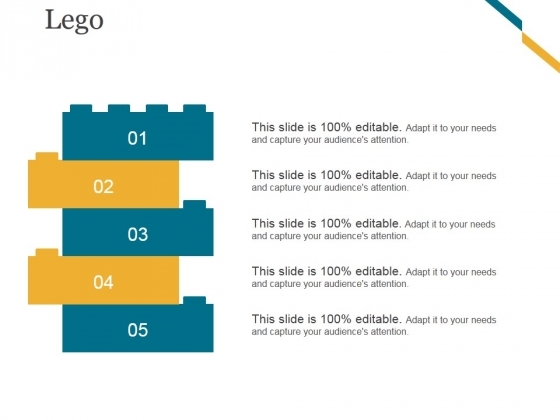 Spur them on with our Lego Ppt PowerPoint Presentation Icon Deck. This is a lego ppt powerpoint presentation file design ideas. This is a five stage process. The stages in this process are lego, business, marketing, management. People often criticise without any cause. 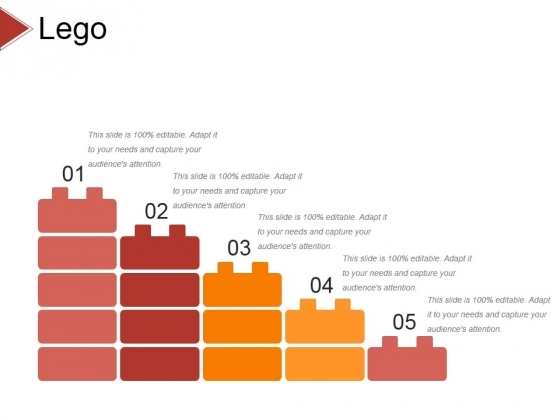 With our Lego Ppt PowerPoint Presentation File Design Ideas you won't give a fig. This is a lego ppt powerpoint presentation model clipart images. This is a five stage process. The stages in this process are lego, business, marketing, management. Present a building with our Lego Ppt PowerPoint Presentation Model Clipart Images. Just download, type and present. This is a lego ppt powerpoint presentation summary outfit. This is a five stage process. The stages in this process are Lego, management, business, marketing. Our Lego Ppt PowerPoint Presentation Summary Outfit provide a key feature. They help the audience concentrate in your thoughts. This is a lego ppt powerpoint presentation professional display. This is a five stage process. 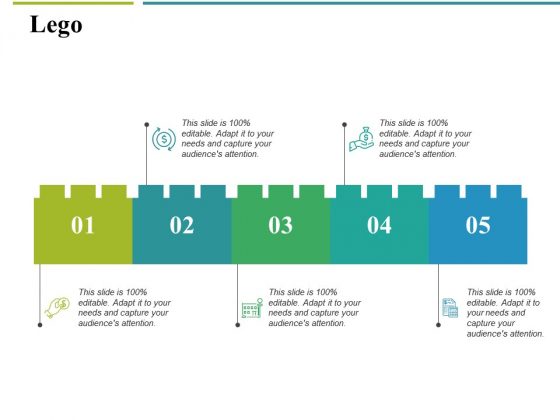 The stages in this process are lego, marketing, business, marketing. Our Lego Ppt Powerpoint Presentation Professional Display are a great equaliser. They take everybody to the same level. This is a lego ppt powerpoint presentation ideas slide. This is a five stage process. The stages in this process are business, strategy, analysis, pretention, lego. Finalise plans with our Lego Ppt PowerPoint Presentation Ideas Slide. Give the final touch to your thoughts. This is a lego ppt powerpoint presentation pictures slideshow. This is a five stage process. The stages in this process are lego, game, marketing, business. 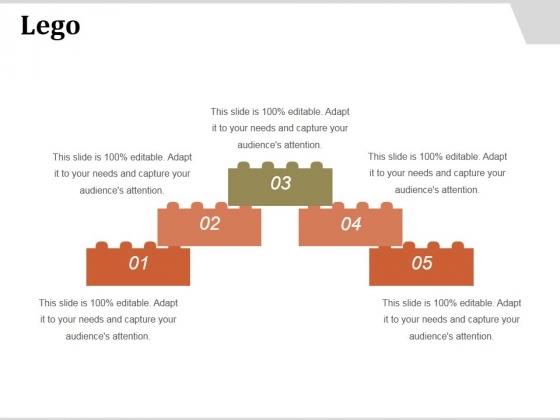 Inform your audience with our Lego Ppt Powerpoint Presentation Pictures Slideshow. Make sure your presentation gets the attention it deserves. This is a lego ppt powerpoint presentation icon demonstration. This is a five stage process. The stages in this process are business, marketing, game, development, block. Inspire team with our Lego Ppt PowerPoint Presentation Icon Demonstration. Download without worries with our money back guaranteee. 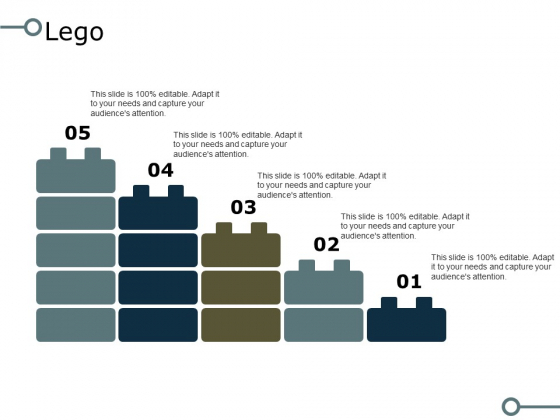 This is a lego ppt powerpoint presentation pictures designs download. This is a five stage process. 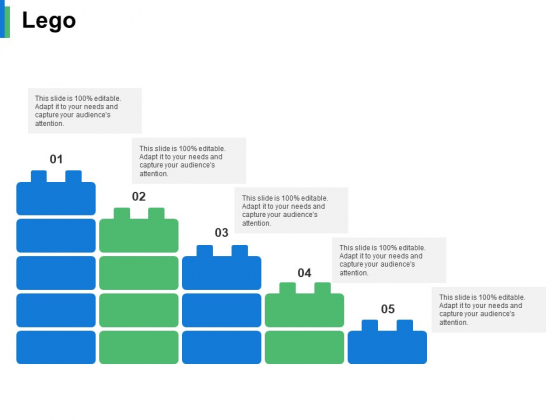 The stages in this process are lego icons, marketing, analysis, game, business, success. Audience approval is always sought after. Our Lego Ppt PowerPoint Presentation Pictures Designs Download will fetch it for you. This is a lego ppt powerpoint presentation professional slide portrait. This is a five stage process. The stages in this process are business, marketing, game, development, block. 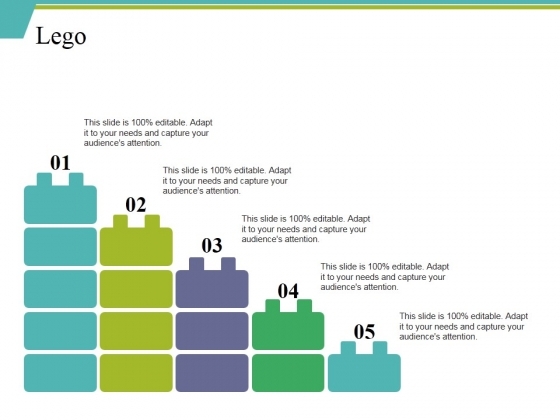 Overcome resistance with our Lego Ppt PowerPoint Presentation Professional Slide Portrait. You will come out on top. This is a lego ppt powerpoint presentation portfolio designs. This is a five stage process. The stages in this process are lego, game, marketing, business. 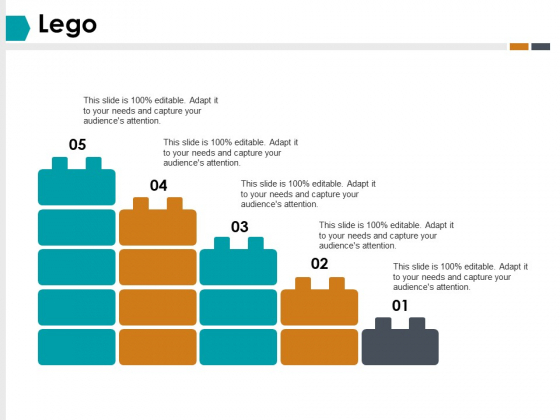 With our Lego Ppt Powerpoint Presentation Portfolio Designs there is no sitting on the fence. The audience will see a definite choice ahead. This is a lego ppt powerpoint presentation infographics structure. This is a five stage process. The stages in this process are lego, planning, business, management, strategy. Convince the audience of the feasibility of your ideas. Ensure comprehension with our Lego Ppt PowerPoint Presentation Infographics Structure. 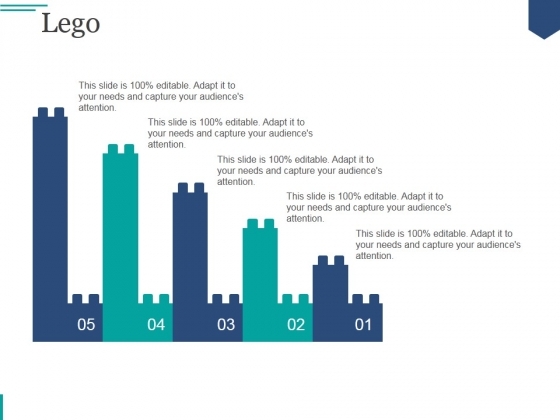 This is a lego ppt powerpoint presentation infographic template shapes. This is a five stage process. The stages in this process are business, marketing, game, development, block. 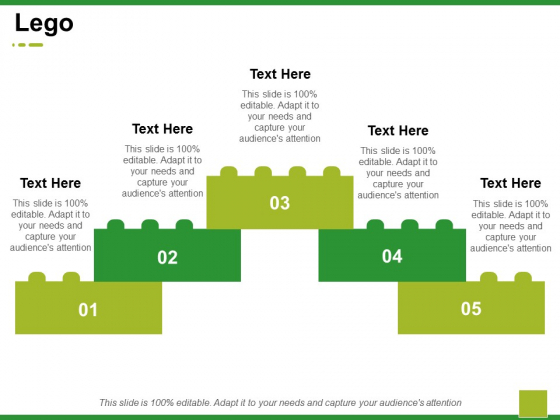 Advise folks to be on the alert with our Lego Ppt PowerPoint Presentation Infographic Template Shapes. Caution them to be careful about lowering their guard. This is a lego ppt powerpoint presentation icon smartart. This is a five stage process. The stages in this process are lego, marketing, strategy, management, business. Guide kids on how to improve academically with our Lego Ppt PowerPoint Presentation Icon Smartart. Handle anyone getting low grades. 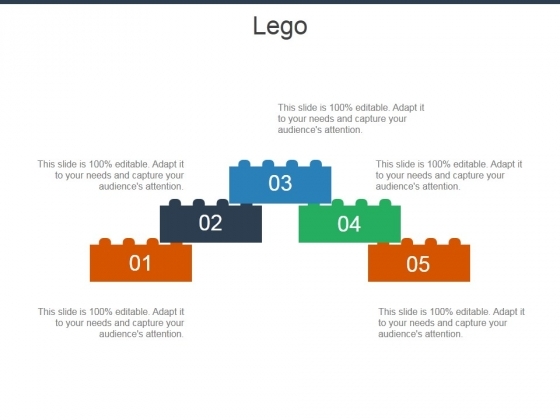 This is a lego ppt powerpoint presentation layouts graphics download. This is a five stage process. The stages in this process are business, marketing, game, development, block. 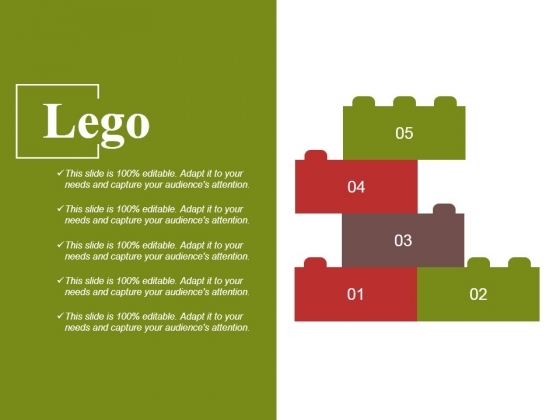 Bring down the lows with our Lego Ppt PowerPoint Presentation Layouts Graphics Download. Ensure less commitment of errors. This is a lego ppt powerpoint presentation outline brochure. This is a five stage process. The stages in this process are business, marketing, management, lego, process. Our Lego Ppt PowerPoint Presentation Outline Brochure enable you to handle the lows. Ensure folks don't begin to despair. 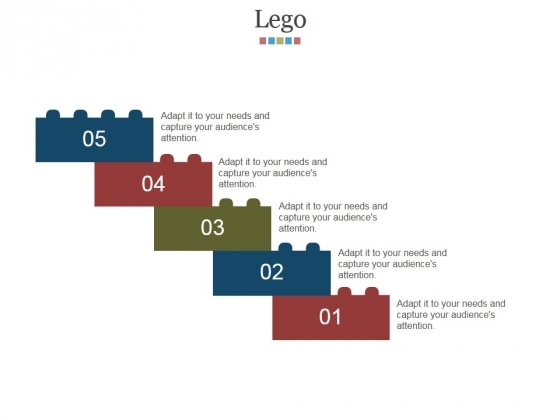 This is a lego ppt powerpoint presentation model diagrams. This is a five stage process. The stages in this process are business, marketing, management, lego, game. 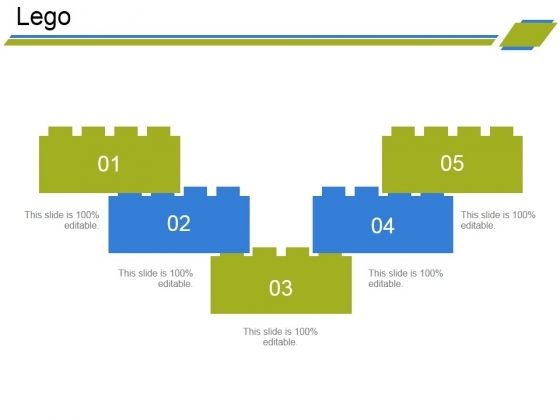 Face the highs and lows with our Lego Ppt PowerPoint Presentation Model Diagrams. Handle each condition with equanimity. This is a lego ppt powerpoint presentation ideas layout. This is a five stage process. The stages in this process are lego, marketing, analysis, strategy, business. 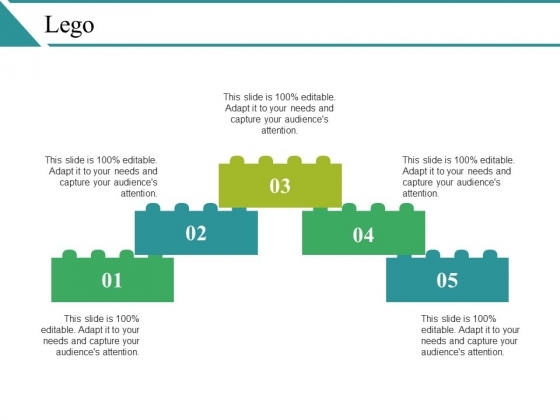 Keep the interest alive with our lego ppt powerpoint presentation ideas layout. Make sure your presentation gets the attention it deserves. 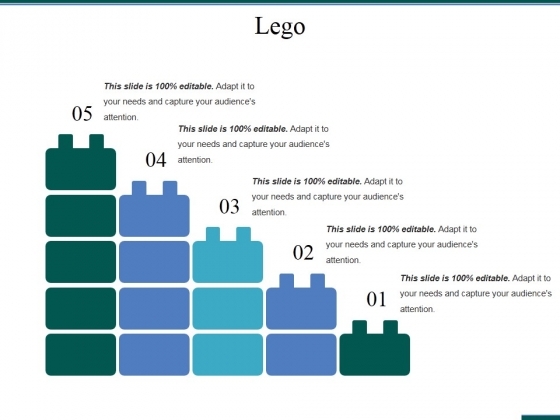 This is a lego ppt powerpoint presentation infographic template graphic images. This is a five stage process. The stages in this process are lego, marketing, strategy, management, business. 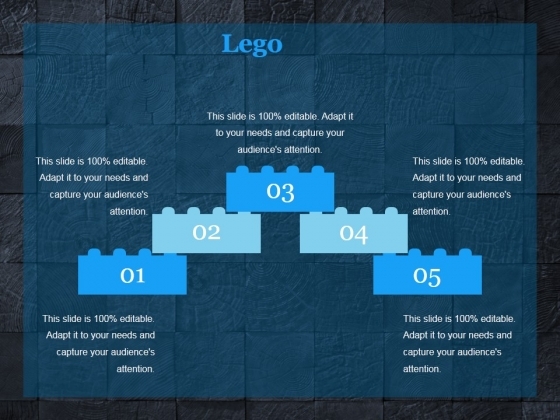 Battle it out with our Lego Ppt PowerPoint Presentation Infographic Template Graphic Images. You will come out on top. This is a lego ppt powerpoint presentation professional example topics. This is a five stage process. The stages in this process are lego, management, marketing, business. 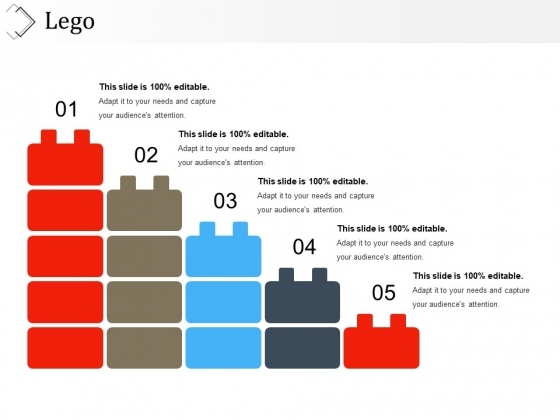 Verbalize your views with our Lego Ppt PowerPoint Presentation Professional Example Topics. Download without worries with our money back guaranteee. 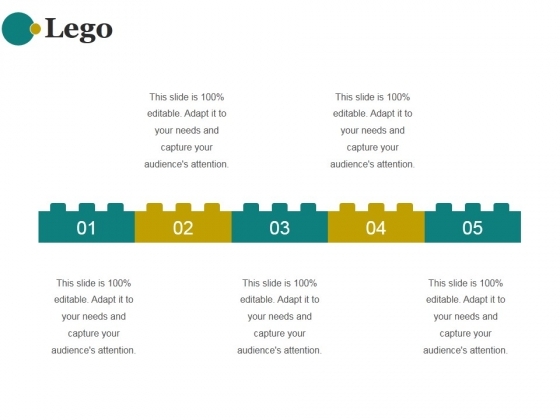 This is a lego ppt powerpoint presentation infographic template design templates. This is a five stage process. The stages in this process are lego, business, success, marketing, management. 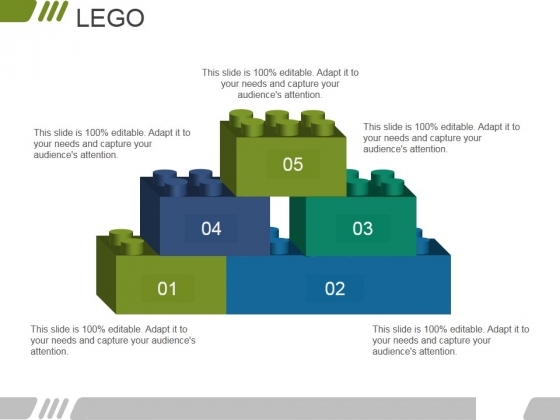 Promote your views with our Lego Ppt PowerPoint Presentation Infographic Template Design Templates. Download without worries with our money back guaranteee. 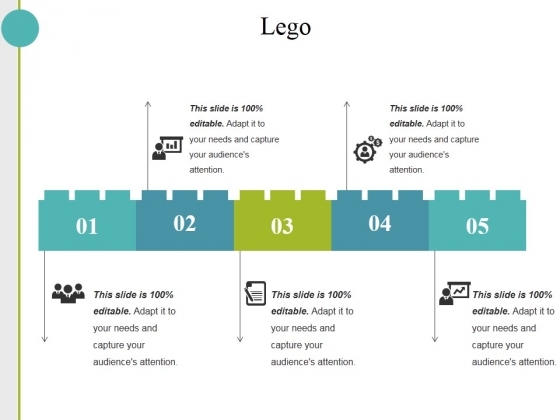 This is a lego ppt powerpoint presentation infographics design inspiration. This is a five stage process. The stages in this process are lego, business, marketing, success, plan. 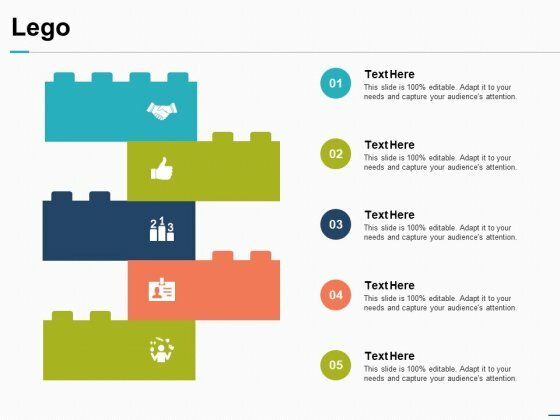 Leave a lasting impression with our Lego Ppt PowerPoint Presentation Infographics Design Inspiration. Make sure people remember your presentations. This is a lego ppt powerpoint presentation professional portrait. This is a five stage process. The stages in this process are lego, planning, marketing, business, management, strategy. Live life in the fast lane. 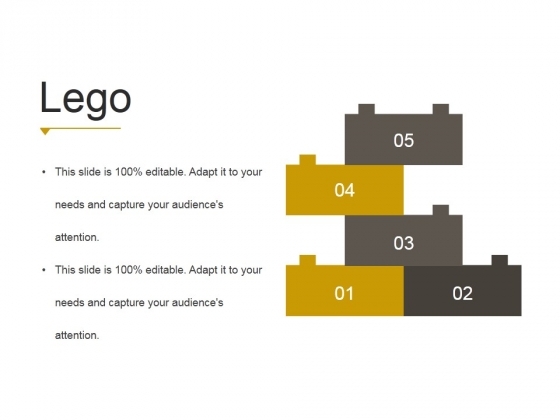 OurLego Ppt Powerpoint Presentation Professional Portrait will accelerate your thought process. This is a lego ppt powerpoint presentation outline clipart images. This is a five stage process. The stages in this process are lego, game, management, marketing, analysis, business. Honest effort always shows through. Our Lego Ppt PowerPoint Presentation Outline Clipart Images are a good example. 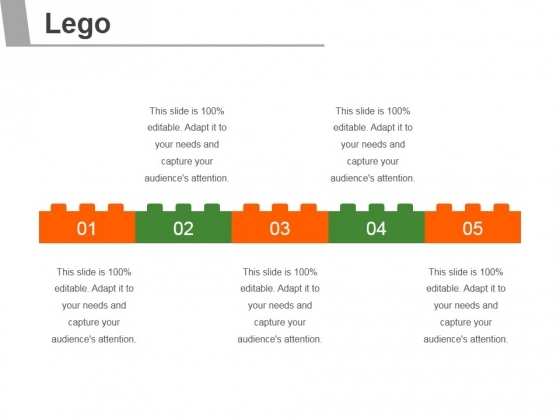 This is a lego template 1 ppt powerpoint presentation professional slide portrait. This is a five stage process. The stages in this process are lego, game, management, marketing. 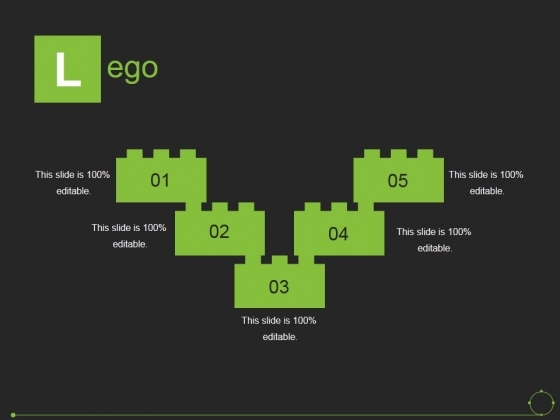 Our Lego Template 1 Ppt PowerPoint Presentation Professional Slide Portrait believe in fair play. They adhere to the ethics of it all. This is a lego ppt powerpoint presentation show slide portrait. This is a five stage process. The stages in this process are business, marketing, game, development, block. Be expressive with our Lego Ppt PowerPoint Presentation Show Slide Portrait. Bring in feeling to your thoughts. This is a lego ppt powerpoint presentation files. This is a five stage process. The stages in this process are business, marketing, game, development, block. 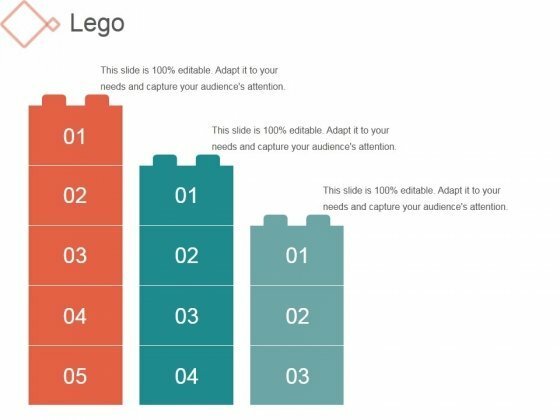 Unite your team with our Lego Ppt PowerPoint Presentation Files. Download without worries with our money back guaranteee. This is a lego ppt powerpoint presentation portfolio. This is a five stage process. The stages in this process are lego, business, marketing, process, success. Oversee plans with our Lego Ppt PowerPoint Presentation Portfolio. Download without worries with our money back guaranteee.